I am immensely proud to be able to finally share these: the May 2018 Canada Post "Bees" stamps, featuring my illustrations. Included in the set is the Agapostemon virescens, and the Bombus Affinis, with an appearance made by the Anthidiellum notatum on the Day of Issue sheet & ink stamp. 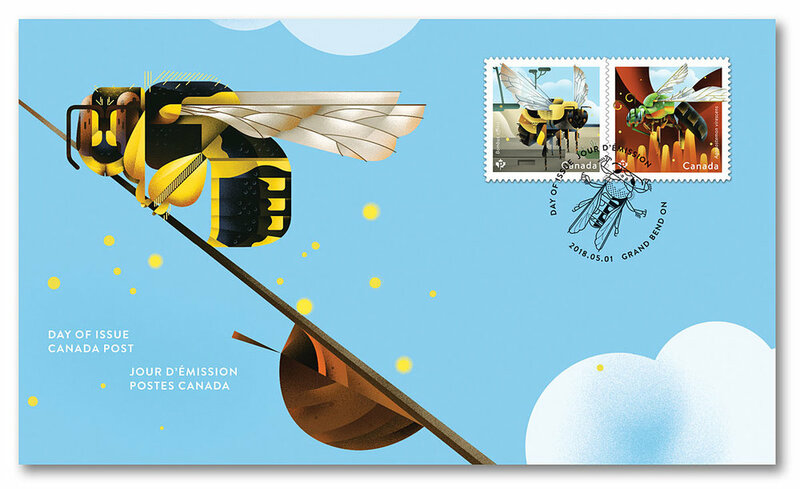 In conjunction with designer Andrew Perro, these stamps were produced to both celebrate and heighten awareness of Canada's threatened bee population. Featured on the stamps are the endangered rusty-patched bumble bee (Bombus affinus), and the metallic green bee (Agapostemon virescenis). The rusty-patched bumble bee was the first bee species to be assessed as Endangered by the Committee on the Status of Endangered Wildlife in Canada, and has only been sighted at Pinery Provincial Park, near Grand Bend, ON since 2002. Below are some of my development sketches - I actually have quite a familiarity with the Agapostemon, as they were a regular subterranean tenant of my parent's front yard when I was younger. Again, I am beyond thrilled to finally be able to share these, and also very thankful to designer Andrew Perro and the folks at Canada Post for including me in such a great project. So, if you get any mail from me in the next while, be sure to take a look at the stamp!